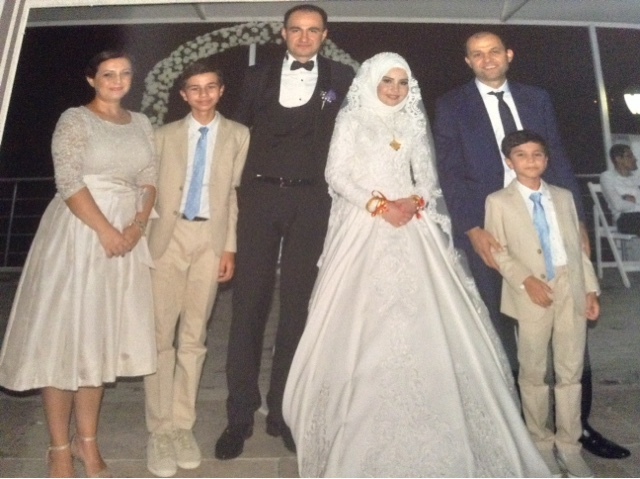 Above: A photo of us with the groom (on the left, my cousin Mehmet) and bride (on the right, Esra). From left to right: my mom, me, Mehmet, Esra, my dad, my little brother Onur. Hi, this is Arca. The reason I haven't posted in two weeks is since I am on vacation in Turkey (as I told you guys in my previous post). For these two weeks, I have mostly been in the city Yalova. I left on Friday for a three hour car ride to the airport, then a 9 hour plane flight to Istanbul, then a one and a half hour ferry ride from Istanbul to Yalova. The first week, during the first few days I wasn't too busy, I just visited family members. Later on, we all got together for my cousin Mehmet's wedding. He married a woman named Esra. 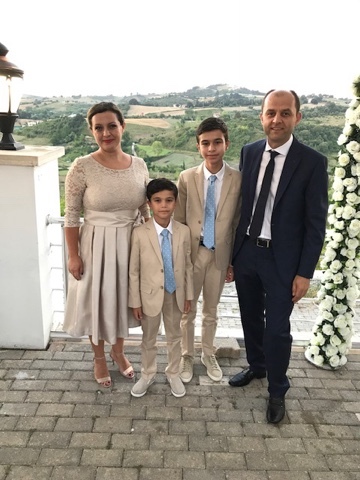 The rest of this post will be showing some wedding photos and also some photos of the other things we did in Yalova, and I will talk about them. Above, from left to right: my mom, Onur, me, my dad. The wedding place was decorated very nicely, and had a view of the scenery around it. We arrived there during the evening, and the ceremony took place that night. 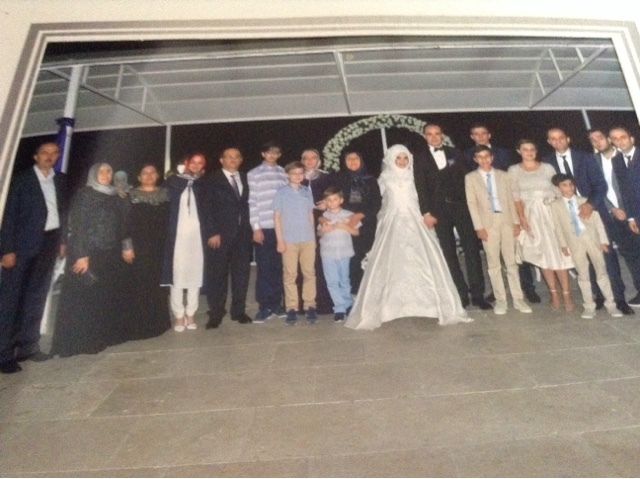 Above: Everyone in my dad's side of the family, from left to right: Uncle Zafer (groom's father), Aunt Semra (groom's mother), Aunt Nermin, my cousin Seda (groom's sister), Uncle Muzafer, my cousins Omer Faruk; Ahmet Emre; and Selim, Aunt Ayşe, grandma Sevim, Esra (the bride), Mehmet (the groom), my cousin Fatih (groom's brother), me, my mom, Onur, my dad, my cousin Yeğit, Uncle Soner. Phew, that was a long list of people! There are a bunch of photos that we took there, I just showed you guys the ones that had me in them next to my family. The day's other than the wedding, I was frequently with my cousins Ahmet Emre, Ömer Faruk, and Selim. We gave them presents of two Nintendo 2DS bundled with Mario Kart. We gave them two other games, which were Animal Crossing and Super Smash Bros. Since we also had a 2DS, we were able to play multiplayer together with them. Using our Nintendo Switch, we played multiplayer as well. It's a good thing that I got an extra pair of Joy-Con controllers, since this let us play together with four people at once. The split-screen was a bit weird, but the tiny portions were easier to see if you sat directly in front of the Switch. Last year, I made a Mii character of everybody in my family, except for my cousin Fatih, and my cousin Mehmet (the one who got married last week). I was able to make one for them as well. The only one I didn't have a chance to do yet was Esra (the bride), which I will hopefully do next year if I have time. The 2DS's built in cameras made facial recognition easy so all the cartoons of our family members are usually decently accurate to what they look like. The Switch has no cameras, so I don't use it for Mii making. Sometimes during the week, we went to my Uncle Soner's house in Bursa, one hour of a drive away from Yalova. He has a huge penthouse at the top of an apartment building. Fun fact: It was once featured in a Turkish magazine as one of the top 100 places to live in Bursa or something like that, due to the nice decorations and layout. 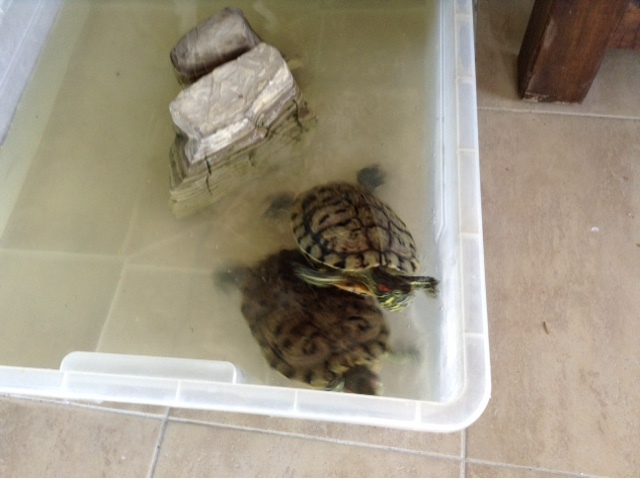 Anyways, Uncle Soner has two pet turtles and a pet cat. 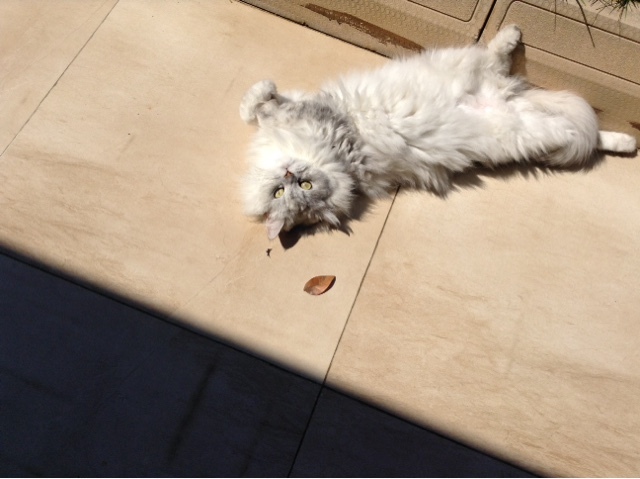 I took some photos of my Uncle Soner's pet cat, İpek. "İpek" means "silk" in Turkish. İpek has so much fur that it makes her look kind of fat. 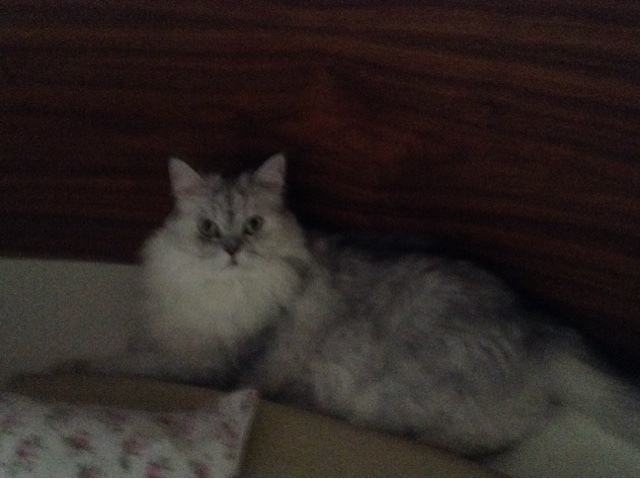 She has green eyes and fluffy white fur. The picture of İpek above is kind of blurry, it was taken using a crappy quality iPad camera and in a dark room. He also has two pet turtles. They are hilarious to watch. Sometimes they try to escape their little pool, and always fail. When you hold your hand up to them and wiggle your fingers, they think that you are feeding them and poke their heads out towards your hand. Two days ago, we left Yalova for a six hour bus ride to Ankara, the capital of Turkey. The bus we were on had free wifi on it, and each seat had its own touch-screen TV attached to it. I took a closer look at the device, it actually seemed to be some homebrew based tablet with an Android 2.0 operating system. It streamed live TV through a custom-menu that even had a browser. It had some games, one of them being a bootleg version of Field Runners, and also, surprisingly enough, the first version of the original Angry Birds from back in 2009. The touch screen was kind of weird though. I slightly lifted off the case of the device and found a tiny homescreen underneath. I was now able to go to the homescreen of Android. It even had a browser, but whoever set up the thing disabled the keyboard and only added shortcuts to Facebook and Twitter. This was so passengers couldn't go to any other unapproved website. I swiped the menu and enabled the keyboard. Now, I was able to use the thing to open up my blog but the lag made it impossible to see anything except the TTHT logo. Once I found out about the free wifi, I spent the rest of the ride watching YouTube. I actually typed up the first paragraph of this post while on that bus, but decided to stop after that to finish the post later. In Ankara, we have visited my mom's side of the family. This is my last full day here. Tomorrow morning, we will go to the airport for a one hour plane flight to our next destination in Turkey: Bodrum. Last year, I also went here. Bodrum has beautiful and calm beaches in the Mediterranean Sea. Last year, I made a blog post about a review of the hotel resort we stayed in last year. This year, we will go to another resort. My next blog post (about the final week, week three of our trip) will be in about a week or so. I will make a blog post at the end of next week or the beginning of the following week after that with a resort review with photos we will take there.